On April 30, we hosted a chat on sponsored content with pros from The New York Times, The American Press Institute and more. As this NOLA13 Presentation - Sponsored Content in College Media demonstrated, even college newspapers are moving into the sponsored content space. This is tough. The workshop back in December resulted in more questions than answers. 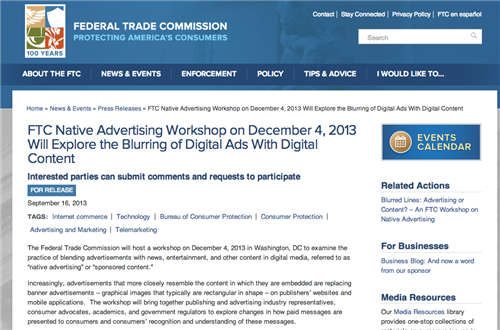 But I do believe the FTC is within reason to try to help readers not be deceived by advertisers. BUT I think the better way would be for publishers and advertisers to encode a set of standards and processes for handling sponsored content themselves -- which is easier said than done. I think the FTC has the responsibility to regulate it in lhe same way they've required bloggers to disclose relationships they have with the companies they blog about. TV shows and Movies list product placement (although in tiny type). Right, I think what Rex is talking about the ethics of disclosure and transparency. The resounding consensus we heard from our summit participants was that upholding the publisher's own brand and integrity and its readers trust is one of the most important principles. After all, the brands are seeking the publisher's audiences and authority/integrity/brand. 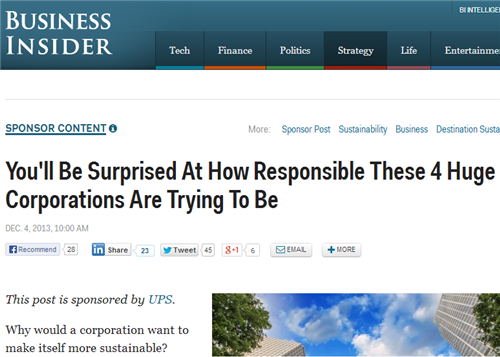 What do you consider an acceptable level of notification when it comes to flagging sponsored content? What creative treatments do you use to distinguish it? 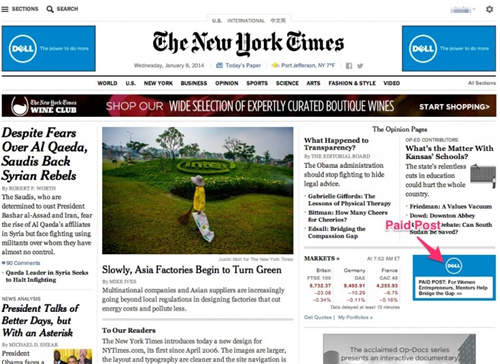 We have a specific "paid post" frame you will see on all of our sponsored content pages. It has a distinct color to it and also includes the advertiser's logo. Millie - it's not mere ethics...the FTC has guidelines related to bloggers. But I agree with you, I think media that want to be regarded with any degree of respect, it's a matter of ethics...and serving, rather than abusing, the reader/user/viewer. Agreed. It's about a commitment to quality content production. Just because it's sponsored or underwritten by advertisers doesn't mean it has to be deceiving, malicious or poorly constructed. In fact, I would argue that those stories commissioned by advertisers actually should be produced with the same rigor and commitment to the craft that newsrooms across the country have been practicing for hundreds of years. Ultimately, it's a win-win for the consumer and the brand. We also include the following language: This page was produced by the Advertising Department of The New York Times in collaboration with XYZ brand. The news and editorial staffs of The New York Times had no role in its preparation. As someone who has created content for brands, associations, companies for 3 decades, the quality of information is enhanced when full disclosure exists. Great content works no matter what the label. Hype fails no matter where it appears. To add one more thing to what Rex said, something that Kimberly Law, GM of the Atlantic said, that I loved, was that her rule of thumb is that the content should be so useful and accurate that the reader wouldn't care whether it was sponsored or not. If the reader would be upset to learn after reading that this content was sponsored, then somewhere you’ve crossed a line. That's a great point, Millie. 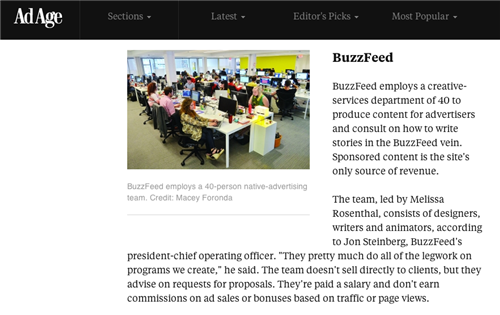 Ad Age took a look at the sponsored content teams at four different publications, including BuzzFeed, where a "a creative-services department of 40 ... produce content for advertisers and consult on how to write stories in the BuzzFeed vein." Now that we have some sense of what sponsored content is, what does a sponsored content team look like, what are its essential parts? First and foremost, I think it's incredibly important to have an editorial director. What does a team look like? Our office looks remarkably like any creative, editorial, design team you'd see in a traditional media. Same work-flow. Same equipment. Same titles. It's merely a different business model. Our content is developed for companies, associations, etc., who have a business model other than the media-business business model. Project managers are key as well. Those folks keep the trains running and make sure all projects are delivered on time. any type of quality content asset. Kaylee: Why is an editorial director so important? An editorial director drives the conversation in each project. I also think it's incredibly important to have someone who came up through journalism. They are our gut-check to make sure projects are storytelling driven. Our goal is to bring Big 'J' journalism to the masses because we believe there is only one way to produce content - the right way. To add, Kaylee, I agree that an experienced point person on the buy-side of the content marketing experience is as important as a CMO is to a marketing team. While we don't call ourselves an "agency," when working with clients in creating sponsored, etc., content, there is a need for someone to have the role of account service. You can't product effective content unless you understand the marketing objectives of the client. There is the need for someone to be able to serve as bridge with editorial needs of the reader viewer / and expectation / project manager needs of the client. So what are the advantages to hiring people who have journalism backgrounds for sponsored content teams? I think journalists are great -- most of our staff has that as a background. However, not all content is journalism. Some is teaching. Some is producing great how-to videos. Some is comedy. Some is great illustration and visual data. Journalists (or former journalists) have a real sense of what a good story is. They can take a brand's objectives and turn them into something driven by human interest. We believe that people who have covered a beat and worked in a newsroom environment can move up and down the content spectrum with a rigor and approach to the craft that often times SME's are unable to manage. That's not to suggest SME's aren't valuable resources in the content marketing equation. But rather, we have seen first hand how journalists are able to easily navigate the dynamic demands of the content marketing arena. In our view, it's makes a big difference. For those readers who have submitted questions for our panel, we'll be addressing them toward the end of the chat. Keep 'em coming! What advice would you offer to journalists who might be considering the world of branded content? What are the challenges to hiring journalists? What industry to you work in? I'll go with Kaylee's point in such advice: Be a great story teller. I'd add that journalists should also call on their skills of being great "explainers." Much of the content that works best for marketers is not the time-stamped kind that journalists love. It's more that contextual, how-to, helpful type of content. Journalists have the research and writing skills to do this well. What is the advantage to brands when working with sponsored content teams? What sort of common pitfalls exist and how can you avoid them? Real Quick... Journalists: Don't lose that hunger and thirst to produce a quality story just because you are hired by a non-endemic publisher. Quality matters. I think sponsored content gives advertisers the opportunity to expand explanation of their brand promise. Once you get an understanding of what the brand promise is, you can work from there. I always ask brands what emotions they want users/readers to feel when they see the sponsored content. Once you have those emotions, you have a lot of room to work with.